BCBP Webinar — Thursday, March 15 from 3-4pm — Is the BBC Program Right for You? Is the BBC Program Right for You? Blandin Foundation is now accepting applications for four new Blandin Broadband Communities, a program that supports rural community efforts to improve both access to and use of broadband that enhance community vitality. Through a leadership development, vision and planning process, community leaders set priorities and develop strategies and projects to move their community forward. Learn more about about BBC application. Join Bill Coleman of Community Technology Advisors and Blandin Foundation’s Mary Magnuson to learn more about the BBC program, including program processes requirements, grant opportunities, and the application process. 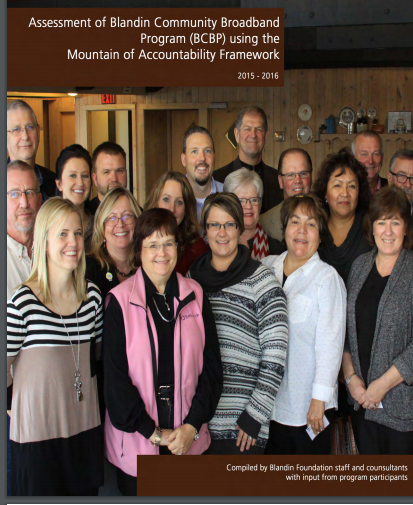 I’m pleased to share the assessment of Blandin’s broadband work looking at the last cohort of Blandin Broadband Communities – the Assessment of Blandin Community Broadband Program using the Mountain of Accountability Framework (2015-2016). In 2014, 92 percent of Sherburne County had access to broadband as it was then defined (lower speeds back then). In 2016, when the definition of broadband was updated to take into account technological advances, only 75 percent of the county had access to broadband speeds of 25/3 (Mbps down/up), and 28 percent had access to Minnesota’s 2026 speed goals of 100/20. 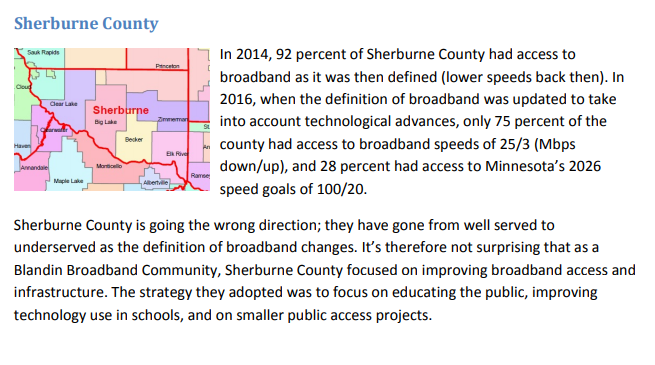 Sherburne County is going the wrong direction; they have gone from well served to underserved as the definition of broadband changes. 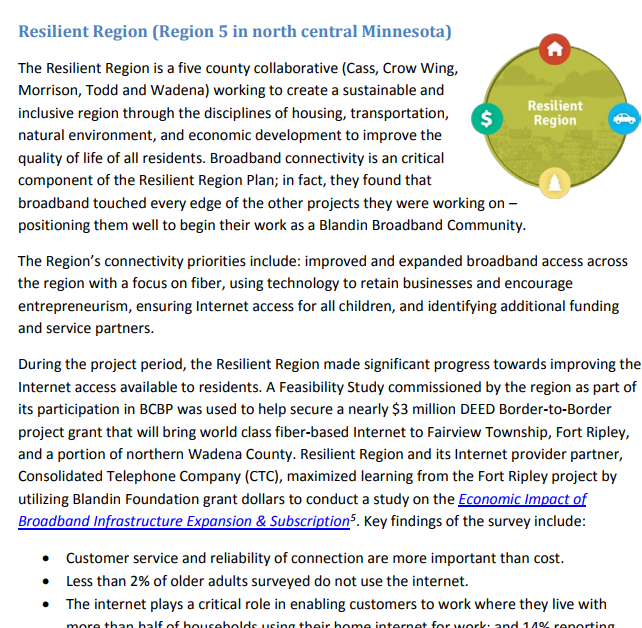 It’s therefore not surprising that as a Blandin Broadband Community, Sherburne County focused on improving broadband access and infrastructure. 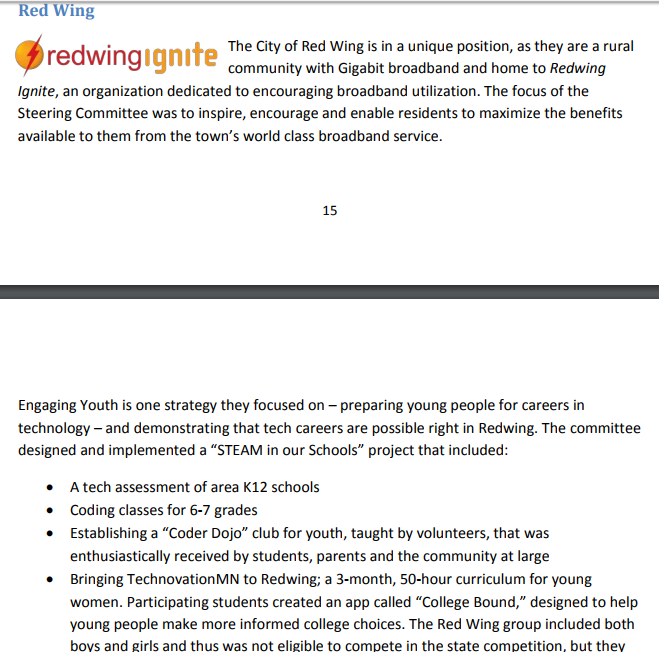 The strategy they adopted was to focus on educating the public, improving technology use in schools, and on smaller public access projects. The City of Princeton is unique in that it sits on the line Between Mille Lacs County and Sherburne County. As I became more informed of the status of high speed, reliable and affordable internet in our community, I was shocked to find out how many residents are underserved, or completely unserved! Businesses were suffering economically due to high rates and lost opportunities. The students in our counties were struggling to complete assignments and do research from home, especially those who reside in rural locations. People couldn’t bank or take care of their online medical needs with poor internet service. Quality of life was being affected and some of the leaders of our community recognized a need for change. The Blandin Foundation has graciously awarded these communities the resources needed to take necessary steps in the right direction. As a member of the Broadband Steering Committee for Sherburne County, our group decided to start a Community Outreach Subcommittee to educate and inform residents and elected officials on the importance of affordable reliable high speed internet service. We would like to see people reach out to the elected officials and express the need for more funding to enhance partnerships between providers and other stakeholders. These partnerships will pave the way for economic viability and secure our place in this fast paced world. Our people deserve every advantage that anyone else gets. We need to stay competitive if we want to see future success. The Steering Committee used grant dollars to hire a marketing firm to create a brand for their group – “SherBand.” They created a webpage, education materials, and promotional items, and wrote bi-weekly blog posts. The community team contacted their elected officials, created a Facebook page, produced an educational video, and participated at various community events and meetings. Infrastructure improvement and access projects included installing Wi-Fi at Rivers Edge Park, Lake Side Park, and the Becker Athletic Complex; extending fiber to the Sherburne History Center, and installing fiber to connect Elk River City Hall to Zimmerman City Hall and fire department. Additionally, while not part of the BBC project, internet at the industrial park in Princeton was upgraded during the project period. For a more recent look at Sherburne County – check out the county profiles I did earlier this year. 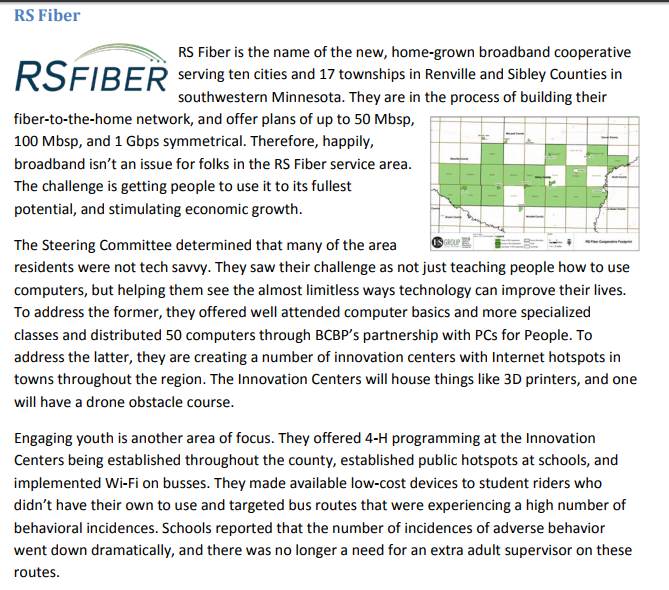 RS Fiber is the name of the new, home-grown broadband cooperative serving ten cities and 17 townships in Renville and Sibley Counties in southwestern Minnesota. They are in the process of building their fiber-to-the-home network, and offer plans of up to 50 Mbsp, 100 Mbsp, and 1 Gbps symmetrical. Therefore, happily, broadband isn’t an issue for folks in the RS Fiber service area. The challenge is getting people to use it to its fullest potential, and stimulating economic growth. The Steering Committee determined that many of the area residents were not tech savvy. They saw their challenge as not just teaching people how to use computers, but helping them see the almost limitless ways technology can improve their lives. To address the former, they offered well attended computer basics and more specialized classes and distributed 50 computers through BCBP’s partnership with PCs for People. To address the latter, they are creating a number of innovation centers with Internet hotspots in towns throughout the region. The Innovation Centers will house things like 3D printers, and one will have a drone obstacle course. Engaging youth is another area of focus. They offered 4-H programming at the Innovation Centers being established throughout the county, established public hotspots at schools, and implemented Wi-Fi on busses. They made available low-cost devices to student riders who didn’t have their own to use and targeted bus routes that were experiencing a high number of behavioral incidences. Schools reported that the number of incidences of adverse behavior went down dramatically, and there was no longer a need for an extra adult supervisor on these routes. For a more recent look at Renville and Sibley Counties – check out the county profiles I did earlier this year.